Jubilee! 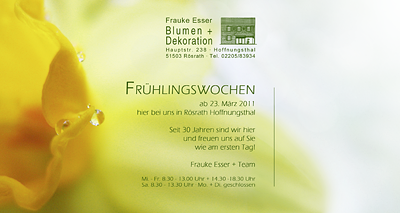 30 years ago Frauke has opened her wonderful flower shop. Congratulations! There will not be an official celebration on a particular day. Instead, starting on March 23 beautiful and unusual spring specials will be on offer for the weeks to come. Frauke does not invite her customers to special events by email. She sends postcards. Special postcards. Maxicards, 235 x 125 mm (9,25" x 4.9") to be precise. This time with focus on the spring specials and the jubilee mentioned but not being too prominent. We've chosen small daffodils (Narcissus), the typical March flower and we played with the term 'Lenz'. Lenz is old fashioned for 'spring' but in its plural form 'Lenze' it also means 'years'. And the back where the address label will be added to the right. 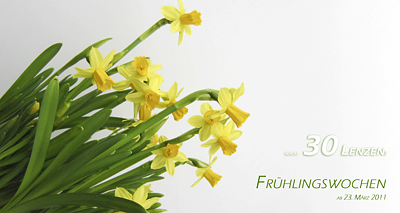 If you are in Frauke's area in late March, you should visit her shop for some flowery treats!